For roof repairs, there’s no one better than David Bange Roofing. Hurricane Irma’s long gone. 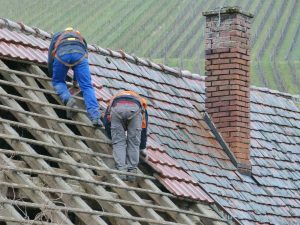 But roof repairs and even some rules changes in some parts of Florida are still ongoing. In the Florida Keys, government leaders are may require metal roofs, which are more expensive but better able to stand up to bad weather. That requirement, though, may require action from the legislature. In addition, Florida law provides that factory-built modular homes will be certified under a state standard, and not subject to more stringent local building codes. Whether the roofs in the keys are metal or not, Hurricane Irma caused the need for roof repairs around the state. More than one in three Florida households have applied for Federal Emergency Management Agency disaster assistance, Marketplace reports. Whether you’re looking for help with roof repairs or planning a new roof, David Bange Roofing is the right place to call. A successful contractor relationship is all about having your expectations met. You expect to work with someone who is accountable, approachable, respectful, and focused on your job. At David Bange Roofing meeting these standards is our highest priority. You won’t get excuses from David Bange Roofing, just a great experience. That is our pledge to you.